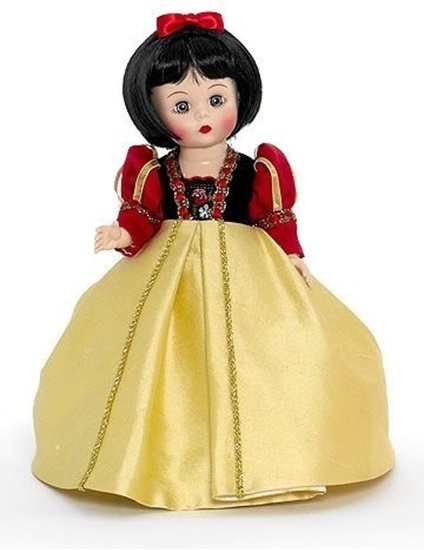 Introducing Storybook Snow White, an 8" bent-knee Wendy with blue eyes, rosy red cheeks and a black bob hairdo. She is dressed in a gown that has a black velvet bodice and red satin leg-o-mutton sleeves trimmed with metallic gold ribbon. Her yellow silk skirt features and inverted pleat and gold braid trim down the length of the skirt. Lace trimmed petticoat, pantaloons, stockings, black flock Mary Jane's and a red satin hairbow complete this ensemble. She is a 2012 Spring edition from Madame Alexander's Storyland Collection.